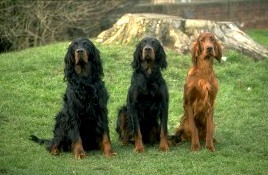 Gordon Setters are the only Scottish gundogs and have been around since the latter part of the 18th century. We also need lots of exercise and plenty of room to play and run, but we�re really not considered boisterous types. In fact, most Gordon Setters that we know are rather laid-back and easy going. Most people can�t resist petting us because we just look the part of man�s best friend. We never, never, ever get tired of hunting! When fully grown, I am between 23 and 27 inches tall (58.4 to 68.6 centimeters) and I weigh between 45 and 80 pounds (20.3 to 36 kilograms). We have no Gordon Setter Breeders listed at this time. Click here to place your Gordon Setter Ad!